There isn’t a home exterior out there that looks quite like scalloped siding. It’s sure to catch the attention of many people passing by. What does scalloped siding have to offer your home? We’ll go over more about scalloped siding below. One of the best parts about scalloped siding is that it can be used for your entire home or to complement other siding styles. This is because it has a feature that no other siding style has: the bottoms are rounded. In other words, the siding is round rather than straight and angular. This gives your home a soft look that can’t be achieved with other siding styles. It goes great with harsher options such as dutch lap and double four siding. The great thing about scalloped siding is that it’s built to last. It’s extremely durable and will last long because of it. For instance, it won’t warp or rot when exposed to moisture like its wood counterparts. Also, scalloped vinyl siding can have a foam board installed beneath it. This board helps absorb shocks when your siding is struck by hail or debris blown by strong winds. That means your siding won’t dent, ding or crack. The foam board does more than make your siding durable – it also improves its energy efficiency. It prevents outside weather from getting in your home and makes it easier to regulate the temperature inside. Not only does this make your home a comfortable temperature year round, but it also helps you save money on your energy bills. Since your furnace and air conditioner don’t have to use as much power to heat or cool your home, you’ll see a decrease on your electric and heating bills. As we mentioned above, your scalloped siding won’t warp or rot when exposed to moisture. That means you won’t have to repair or replace it as often. Plus, the colors of your siding are baked into the panel when they’re manufactured. That means the colors will never fade over time – you won’t have to paint or stain your siding ever. 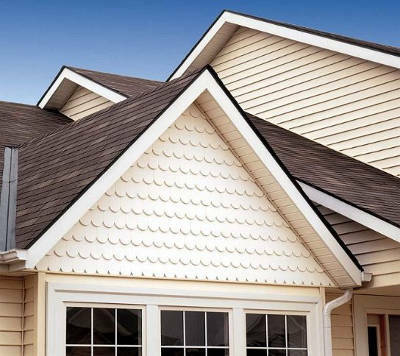 The key to getting great scalloped siding is finding the right company in Milwaukee. Feldco is the perfect option because of our experience, premium products and expert installation. We’ve been serving the Midwest for over 40 years and have helped over 350,000 homeowners with their home improvement projects. All of our products are built specifically to withstand Milwaukee’s weather. Plus, our siding is installed by factory trained and certified professionals who will make sure your job is done quickly and efficiently. Don’t wait, get a free quote now and start your replacement siding project today.